In order to understand the dynamics of accretion and outflows in the supermassive black hole (SMBH) at the Galactic center, the time-dependent multi-dimensional numerical simulations are needed. In BlackHoleCam we developed a numerical simulation tool, Black Hole Accretion Code (BHAC). BHAC is a new adaptive-mesh-refinement (AMR) multi-dimensional general relativistic magneto-hydrodynamic (GRMHD) code, which has designed to solve the GRMHD equations in arbitrary spacetimes (see here for details) and exploits adaptive mesh refinement techniques with an efficient block-based approach. How evolve magnetised accretion torus around SMBH? 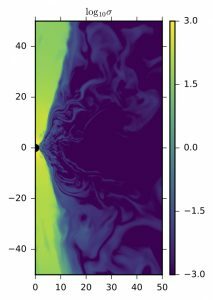 In the GRMHD simulations, we consider a hydrodynamic equilibrium torus threaded by weak magnetic field, which rotates around a central BH. 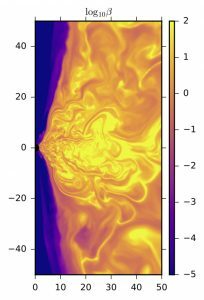 In the evolution, inside weakly magnetised accretion torus, the magneto-rotational instability grows and makes turbulence. The MRI driven turbulence in the torus leads to accretion onto the central BH. 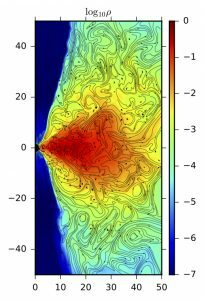 Near the central BH, the magnetic field is accumulated and the magnetised jet is formed. It is low density and strongly magnetised.